Apple. – Life Is Such A Sweet Insanity. I’m writing this on an iPad Pro. At work. So I started this blog entry, writing about today’s Apple keynote event at the Steve Jobs Theatre at Apple Headquarters (“the Spaceship”). I was going to list each of the services Apple announced today and my associated thoughts. It was all to be positive, because I really enjoyed the keynote today. But I couldn’t bring myself to sound like a tech pundit, because that’s not what I am. I’m one of the Crazy Ones. My LinkedIn Profile starts with two words: “What box?”. I don’t think outside of the box, I can’t even find a box. I don’t see the big picture because I’m not looking in the same direction and I’m probably not even in the same room. It’s amazing that I have worked for several Fortune 500 companies during my career because I really subscribe to the whole “Think Different” philosophy. And this is something I’m proud of. What struck me about the Apple keynote today was the genuine feeling of passion. The artists, the creative ones, even the ones presenting today, all seemed so very passionate about what Apple was showing the world today. A new way for a credit card to work. A new way to read your favorite magazine. New ways to find your favorite online games and new ways to find your TV shows, all on your own terms. Apple’s huge push of privacy is a welcomed change of pace in this ever growing economy where the user is the product, not the consumer. Apple doesn’t want your information, Apple doesn’t need your information, and Apple has no way of sharing your information. That is awesome. We need more of that in this digital age. 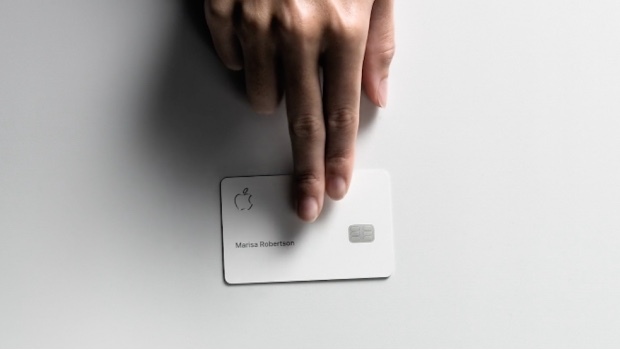 Am I going to sign up for an AppleCard? As a guy that uses ApplePay everywhere he can, you bet your sweet bippy I am. I’ve already asked the CTA when I’ll be able to add my Ventra (transit) card to my Apple Wallet. I’m already reading my favorite magazines in Apple News+ and I’m really looking forward to the original content Apple will bring to the world in Apple TV+. I was moved when I saw Tim Cook tear up when he hugged Oprah after her speech during the keynote today. Such passion. In the speech, in the reaction, in the creativity. We need more passion for creativity in the world. Be a Crazy One. I’ve started editing videos on my iPad Pro today. Ten years ago I never thought I’d be using an iPad Pro to shoot, edit, and share video, but here we are. Technology isn’t only about spreadsheets and word documents and slides. It’s about what we want it to be about. Apple announced some changes to their iPad lineup today and I’m just thrilled! 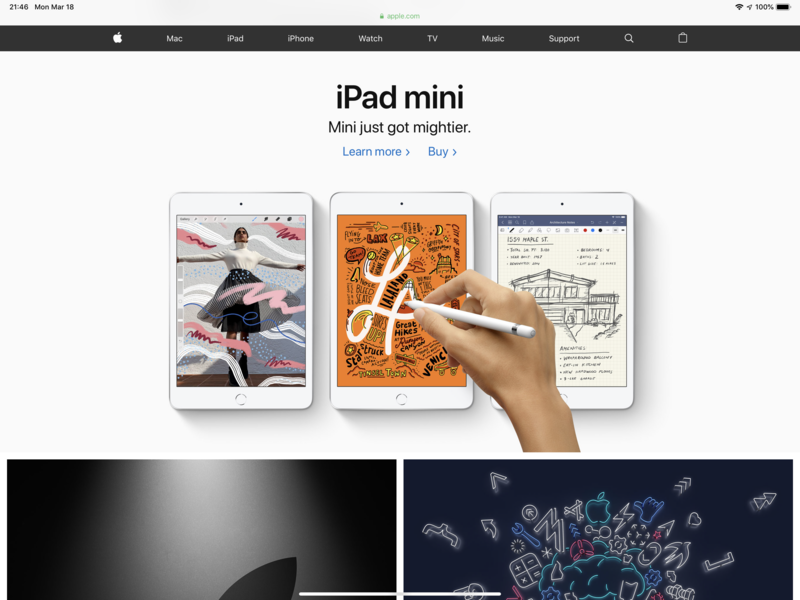 I’m still reading up on the announcement, but the iPad Air and the iPad Mini have both been refreshed with the latest Apple processor and Apple Pencil support. What wonderful news! 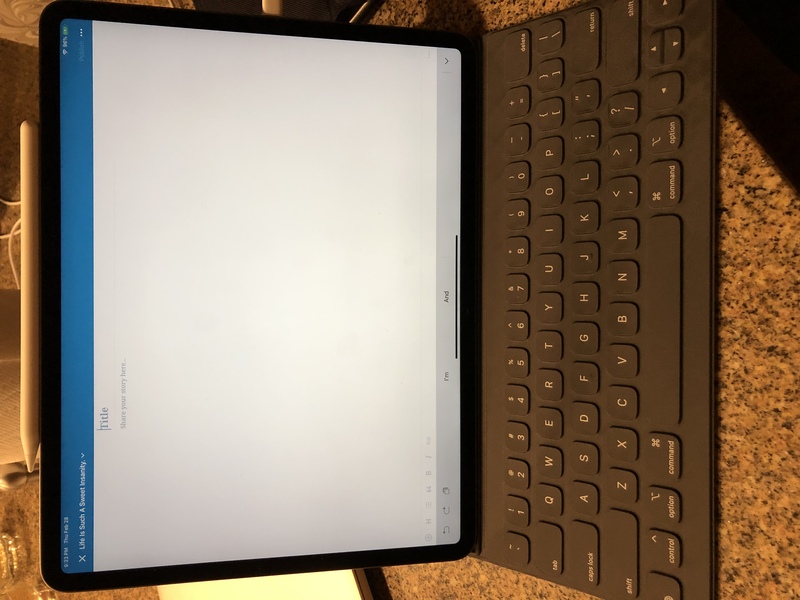 I truly believe the tablet will be the computing device of choice in the future, so seeing the “lower end” iPads get refreshed by Apple helps build that momentum to the future I’m envisioning. 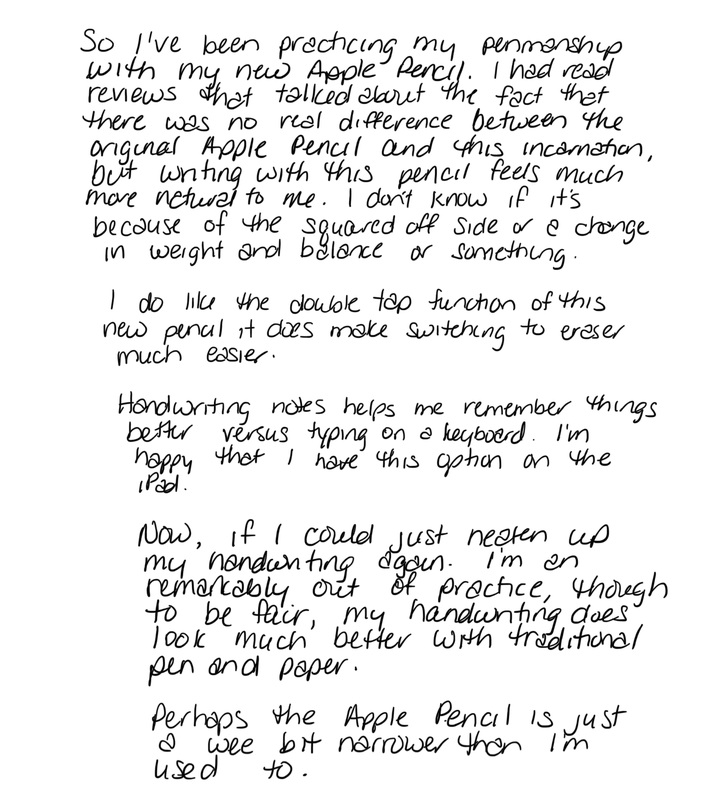 I’m especially excited about the new iPad Mini with Apple Pencil support. Before my iPad Pro 10 (with Pencil support), the iPad Mini was always my tablet of choice for when I was flying. It ran my preferred Electronic Flight Bag (EFB) ForeFlight beautifully, even though the iPad Mini 4 was starting to fall behind in horsepower for that particular use. Using the iPad Pro 10 and an Apple Pencil in the cockpit has been wonderful, as ForeFlight has grown in leaps and bounds over the past couple of years and features beautiful functionality with the Apple Pencil, but the iPad Pro 10 is slightly too big for the airplanes I fly (primarily the Piper Cherokee series, Cessna 172s, and now the Diamond Sky DA-40). It works and works well, it just feels like it takes up a little too much space. Having an option to go back to the smaller iPad Mini is wonderful news. I’m happy to see that Apple made this iPad announcement today, so they can focus on their new services offerings and their big announcement next Monday on 3/25. You know I’ll be watching the keynote. I’ve always found the idea of taking a photo with an iPad to be odd. The camera is very capable, but it’s like holding up a frying pan to try to capture the moment. 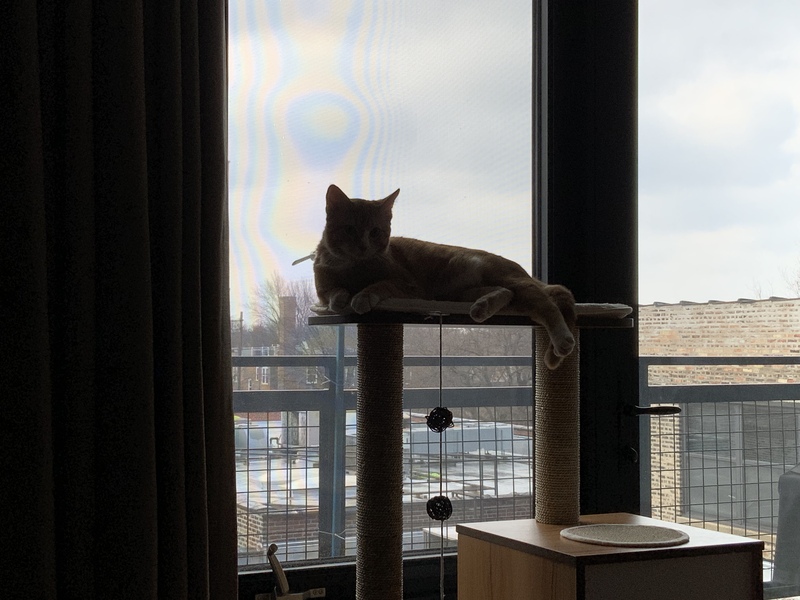 Truman is hanging out on his cat perch. I’ve just woken up and am positioned on the living room couch seeing what’s going on in the world today. I’m not afraid to share my “just woke up” face. At least I don’t have bed head. The portrait mode on the user facing camera is impressive. The shots on here are really cool. So I’ve been trying to decide on my next computing device. 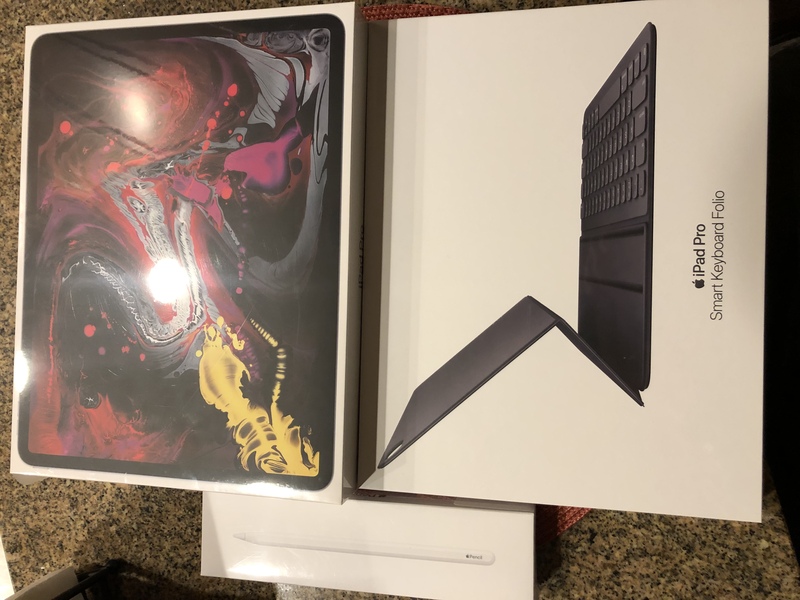 Would I jump ship and leave the Apple ecosystem? Would I buy another refurbished laptop? 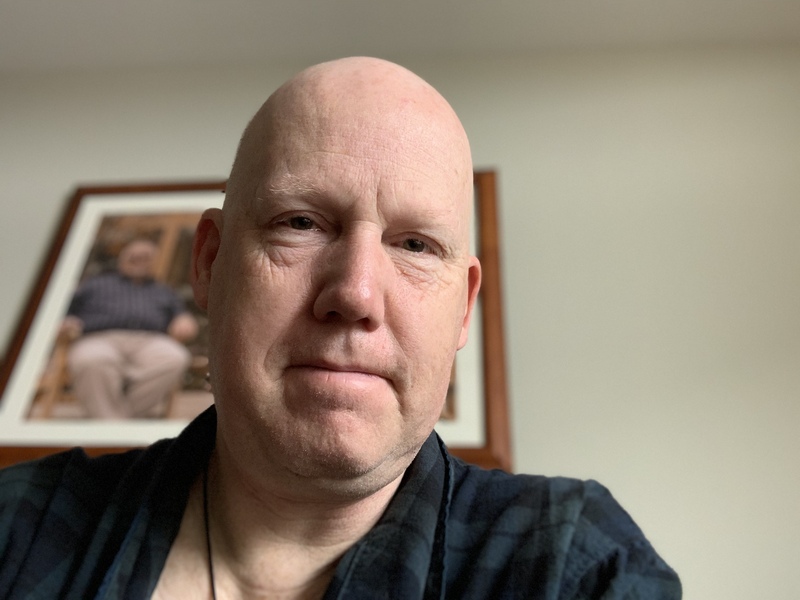 Would I become a Linux evangelist again, intending on sticking to the platform but invariably leaving after a month or so? 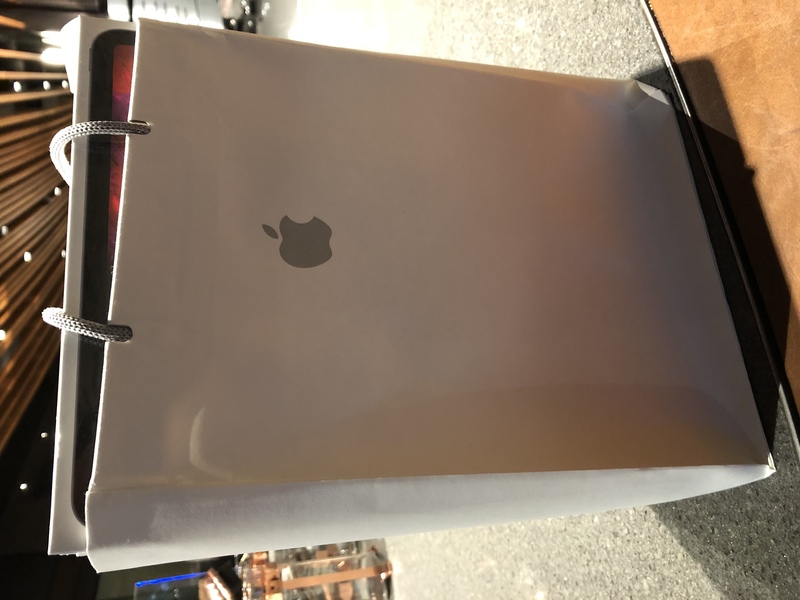 After my research and thought, I decided to settle on a new iPad Pro. This is the full sized version. I opted for WiFi only. We don’t need another monthly charge with AT&T. My original generation iPad Pro 10 is a wonderful little machine and it will continue to serve me for my Electronic Flight Back. The smaller screen, coupled with an Apple Pencil, is perfect for me and using ForeFlight in the cockpit. It works well in that regard, however, I found the screen to be slightly small for everyday use. On the other hand, my beautiful mid-2015 15-inch MacBook Pro works brilliantly but it feels a little bulky to haul around in a backpack. Other than editing music, putting together flight videos, or working on graphics for web sites, it’s a little overpowered for when I’m on the go. The iPad Pro 12-inch fits exactly what I’m looking for. It wasn’t an easy decision for me to make. I looked at the new Google Pixel. I thought about buying a smaller MacBook or MacBook Air to carry on the go. Ultimately I decided that what iOS 12 offers, especially when coupled with the new Apple Pencil and a Smart Keyboard Folio, fits my needs in this “channel” perfectly. I’m looking forward to embracing this new facet of my the Apple Ecosystem in my daily computing endeavors. Maybe it’ll provide even more inspiration for me to be creative. I’m finding it more and more difficult to remain exclusively on the Apple ecosystem with my computing needs. Today I went for a drive between Chicago and Rockford, Illinois. I purposely took some backroads, made quite a few random turns to get a sense of the area and decided to head home after an hour or so of meandering. I asked Siri for directions home in Chicago. She had me turning left and right through the farmland, trying to get me to a main road. I was watching the compass indicator in the Jeep all the while. I have a great sense of direction and I usually know what direction I’m headed in at any given time. When I got to the intersection at the first numbered route, Siri said “Turn left onto Illinois Route 176 West.” At the time I was facing south. The compass in the Jeep confirmed that I was facing south. I know Chicago was to my east, or at the very least southeast, so heading west on a route wouldn’t have made sense. I turned left and saw a sign that said Illinois 176 East, even though Siri said turning left would have taken me west. I figured she was just having a day and carried on. “Turn right onto US Route 12 North”. Wait a minute. Heading east on Illinois 176, as confirmed by the signs I was passing, meant that if I turned right onto US 12 (no cloverleaf or anything) I would be turning south, or at the very least, southeast. I turned right onto US 12 and that it was signed East US 12, South Illinois 59. Nowhere was there a sign that said north, even though Siri said to turn right to turn north. Looking at the map, to get onto US 12 North (which was actually US 12 West and Illinois 59 North), I would have had to turn left. This sort of frivolity continued for three more turns, where Siri told me to turn left or right in the proper direction but she didn’t know what the direction was, she was 180 degrees turned around. She was insisting that I basically head west to get to Chicago, even though she was pointing me eastward. I decided to play it safe and I turned off Apple Maps, moved it to my “unused” folder and fired up Google Maps in her place. Google Maps knew which way was what and successfully got me home in less time than predicted by Siri. 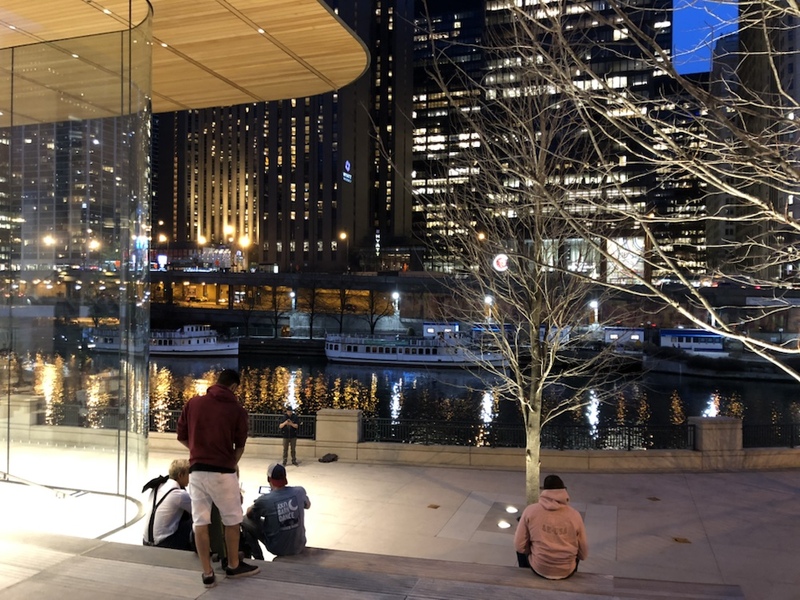 For all the premium money one pays for the “Apple experience”, I’m concerned with the rash of bugs that have been present in seemingly the majority of Apple’s software lately. Apple Maps has had a bad rap for several years, and I keep hoping that it’ll get up to speed with the rest of the world, but it just doesn’t make the grade. So this morning Apple released a security update for their latest version of macOS, called High Sierra. Earlier this year, macOS High Sierra was touted as being a new version of the operating system on Macs that would bring stability and a whole bunch of enhancements under the hood. The focus of High Sierra was to make its predecessor, macOS Sierra, better. 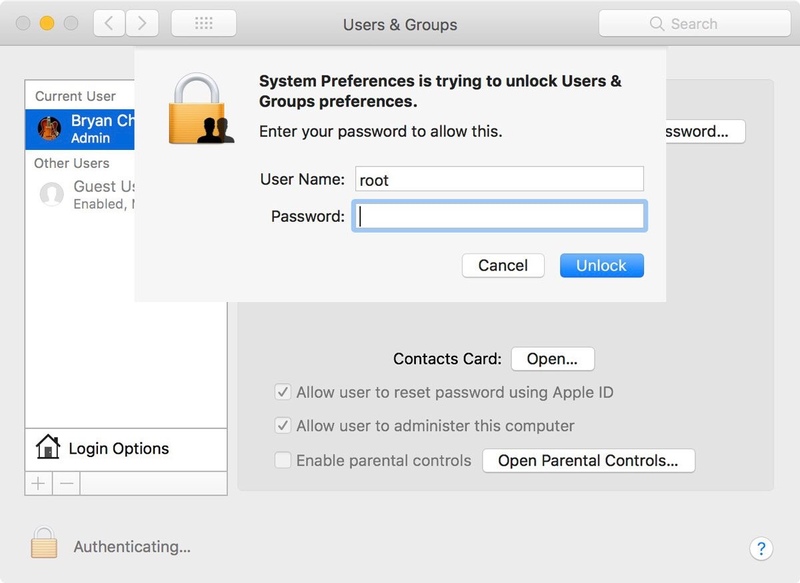 The purpose of today’s Security Update was to correct an issue that was announced throughout Social Media yesterday: that a user with physical access to a Mac was able to get to root user privileges, otherwise known as “Administrator” without using a password. Entering root as a username and then skipping the password prompt with a carriage return granted full access to the Mac. No password necessary. From there, anyone could do ANYTHING they wanted on the Mac: change usernames, delete everything, send out email, anything and everything is possible with root access to a Unix based machine. To say that this was a security concern is a vast understatement. You wouldn’t be too far out of the realm of reality if you were to say that this was probably one of the biggest security blunders of the computer age. The fact that this was pushed to production as part of the official version of macOS is mind boggling to me. Absolutely mind boggling. Look, mistakes are made. I get that. As a software developer by trade I make mistakes all the time. My code is far from picture perfect and I’ve caused more than one user to scratch their head as software I’ve written has gone way off into the weeds due to simple bugs that I later squashed. The thing is, a lot of my bugs are found and corrected long before the software is released. That’s why we have things like UAT, or User Acceptance Testing. That’s why I spend hours testing and retesting my software before it even gets to UAT. To think that this sort of thing was missed by the macOS team at Apple, which one would presume is a large team at one of the largest corporations in the world, is mind boggling to me. I’m impressed with how fast Apple pushed a patch to users. But honestly, I want more. I want to know how it happened, how secure the patch is and what the macOS team is going to do to avoid making a blunder of this magnitude again. This isn’t a matter of holding the Mac wrong or dropping a Mac from a ridiculous height and then claiming it can’t withstand the pressure, this is Security 101 on what is touted to be one of the strongest operating systems in the industry. Apple dinged my faith and my trust in their software with this latest gaff. How do I know that my text messages aren’t going to start broadcasting to the wrong person? Where’s my guarantee that my data will always be encrypted and secure when bugs of this magnitude are starting to appear in their oldest operating system? When a user pays a premium price for Apple’s products and services, they should never be expected to Expect Less. Mediocrity is not an option. Apple used to do better. They need to prove that they can do better once again.